Well, if you've been reading my blog for a while, you know of my love for Premier Protein's shakes. Because I'm almost 20 months out I don't rely on them as heavily as I once did, but you can guarantee that there will always be a case of them in my house. I've tried the chocolate, the vanilla, and now here is my review of the third shake in this trifecta of goodness! Truth be told, I was really hoping for a small, show tune singing, strawberry to jump into my mouth and start jazzhandsing it. What I got was a slightly washed up, middle aged, crooked wig wearing, strawberry singing Tina Turner covers and chain smoking. Not as energetic, but still entertaining nonetheless. The strawberry shake had more like the essence of strawberry and I thought that it tasted an awful lot like the vanilla. That's not a BAD thing though cause I did like the vanilla. I will repeat though, This Is Not A Bad Thing, just different than I expected. Premier has added another solid product to their line. It isn't overly sweet, overly thick, and it has a really clean taste. The flavor actually kinda reminds me a bit of Quik and I say that in the most nostalgic way possible. I like it, I really do. Let's look at the stats, though. These magical numbers are what sets Premier's shakes away from the rest of the bunch. Post ops, who're dealing with limited stomach capacity need the most bang for their buck. Let's look at some math here. 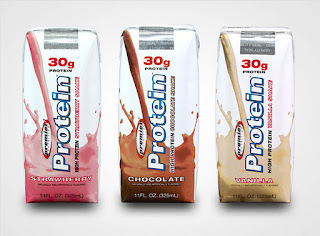 Premier has 30 grams of protein in 11 ozs of liquid. MM has 25 grams of protein in 14 ozs of liquid. So you take the grams of protein, multiply it by the exponential goodness of CAKE (everything in life as to do with cake), divide it my the numbers of times I have told you I'm lazy and inefficient minus the number of pairs of shoes in my closet, then divide by the inverse of the cube root of my fabulousness and you get something that looks like this. AA 1.36 grams of protein per oz. 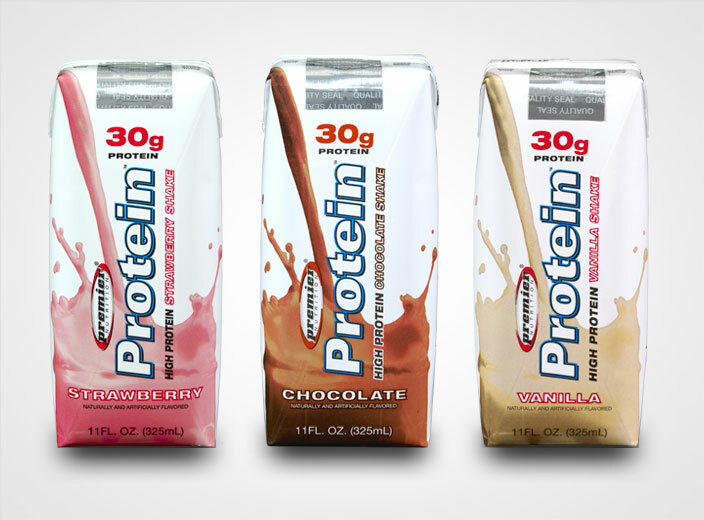 Premier is the protein champ and packs in a ton of protein in a really small package. You would have to drink 2 of the AA shakes to get the amount of protein found in one Premier Shake. Anyway I'm going to wrap this up by telling you that I would gladly drink any of their shakes. I support their products and I support who they are as a company. They were the only company to support me in the Walk From Obesity and that really says something. In addition to that, they have top notch customer service, so should you have problems with any shakes, send them an email and let them know. FYI, they're not paying me one cent for anything I have written here although I am not above taking envelopes in clandestine meetings in seedy places . I'm just showing some love to the Premier Protein peeps for the love they've shown me. Ooooh, I'm jealous that you 1. Found strawberry 2. Got to sample it and 3. that you can find vanilla. I'm *stuck* with Choc. because I've only found vanilla ONE time (yes ONE) at Costco. Didn't know I needed to back up a semi truck and load it up like looters during a hurricane. Anyhoo, thanks as always for making me laugh. Going to keep my eyes peeled for some strawberry...maybe in 2015 I'll get lucky! @sheila The vanilla shakes are making a limited return at Costco. You should be able to find them now! We don't have a Costco here yettttt and I don't have a membership to Sam's where they sell the Chocolate but I did get a sample of the strawberry. I'm not a strawberry flavored fan but I actually LOVED this, and you are right, it reminds me of Nesquik. I would love to try the chocolate and vanilla sometime. I think they would be perfect for the days when I have to run out of the door and I don't have anything handy to tame the tummy talking. Thank you my sleeve sista...I FOUND vanilla at Costco. I had a little chat with hubby about which he prefers and he is like me: we like them both. I only bought one case of each though and even though I showed restraint at the Premier Protein section I still chunked over more than $300. Yipes! Are they going to start selling the strawberry ones anytime soon?